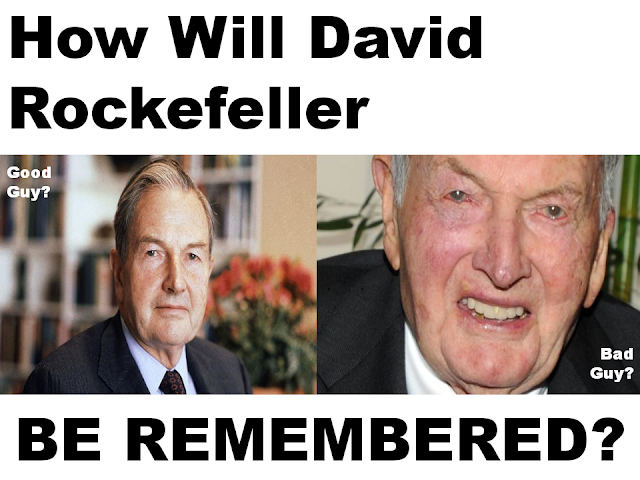 How will "Billionaire Philanthropist" David Rockefeller be remembered? Well, that's definitely a question for the "ages" as two different tales emerge about the late great person that many "common people" hate. If you pull up this LA Times obituary article, you'll see a favorable article about David Rockefeller. However, many facebookers have shared that same article with a very different caption. Let's not forget that David Rockefeller, whether direct or indirect, is in cahoots with other families that control our mainstream media. With that said, can you really discount the "alternative" news who charge this man with having done so much evil to this Earth? Of course the TIMES and various mainstream outlets are going to portray Rockefeller as a man that "impacted lives" and such but on the flip side of that coin, the question remains: at who's expense? Was David Rockefeller a necessary evil? What will he be remembered for the most? Email Us your responses!